5 negatives : b&w; ; 4 x 5 in. Gathering of Caucasian and Asian people at the Long Beach Community Center, including Long Beach Mayor George M. Vermillion in Long Beach, Calfiornia, 1956. 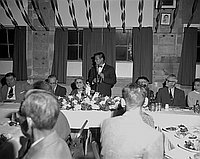 Includes men speaking into microphone at the head table at a dinner, man carrying an American flag and a Caucasian couple. Typed on original negative envelope: Long Beach Community Center -- 1766 Seabright -- Oldest Issei Champter Pres -- Mayor Vermillion.